Your phone provider could be your new office landlord. 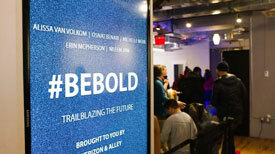 Verizon is dipping into the market by converting former telecommunication space to office space and partnering with Alley to run it. “Alley, powered by Verizon,” the new membership-only, 10,000-square-foot space in Cambridge is scheduled to open at the end of June at 10 Ware St. The facility served as a central office for Verizon (NYSE: VZ) that previously housed network and telecommunications equipment. Breather is on an aggressive growth mode with a closing on a $40 million dollar round led by Menlo Venture in participation with Valar Ventures, RRE Ventures, Slow Ventures and Real Ventures. The team of Justin Harlow, Bonny Doorakian, Robert LeClair and Wil Catlin is handling their Boston expansion. Breather has no membership fees or long-term contracts. Instead, the company offers workspaces on a pay-per-use basis through the company’s proprietary app. Never had this crossed my mind, the social do’s and don’ts of Co-Working and its larger implications. To get a glimpse of what manners will be like in the office of the future, it behooves us to look at co-working spaces, those offices peopled by freelancers or by workers who have different employers. Many sources predict that by 2020, half of the work force will be freelance. It is clear, Co-working is a valuable resource when launching a company. Depending on, in part your age, or size of your company, shared space is by far changing the traditional office environment. No longer are we a society of cubes and offices; we now have huddle rooms, phone booths, collaboration stations and quiet spaces. This plan includes access to our digital Member Network, events, and services, 24/7 keycard access at your home location, as well as 2 monthly credits for reserving workspaces and conference rooms. 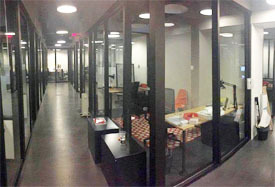 An assigned desk space in a large open area shared with other members. This dedicated space comes with a lockable filing cabinet for your personal belongings. Desktops may be set up and left overnight. This plan includes access to our digital Member Network, events, and services, 24/7 keycard access at your home location, as well as 5 monthly credits for reserving workspaces and conference rooms. A fully enclosed, lockable office space. Your company can add on more offices as you grow. This plan includes access to our digital Member Network, events, and services, 24/7 keycard access at your home location, as well as monthly credits for reserving workspaces and conference rooms that correlate with your office size (minimum of 12 credits for a 1 person office). You can read more on the Daily Free press website. 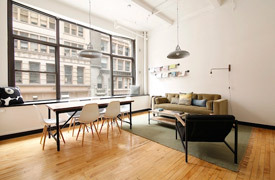 0	Open Floor Plan or Private Offices? Dot-com companies in the early ’90s struck gold when they put all their employees in a single room (or more often, garage). Since, the open concept plan has widely replaced office-lined perimeters for execs and a bullpen center for support staff, as furniture vendors continued to develop solutions that aligned with those times. And while some industries (tech, creative, communications) adapted more willingly than others (legal, financial), the design world embraced the idea that humans as social animals needed areas to congregate, collaborate and socialize…And from the open office came the creative office. 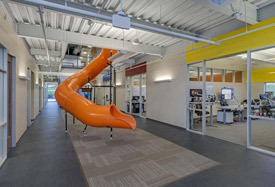 You know the one…it usually has a slide (like HCSS’s Sugar Land office above), or a gourmet coffee bar with lounge area made from reclaimed wood. Elfreda says open office and creative office are similar, but the creative office is definitely an evolution of the former. 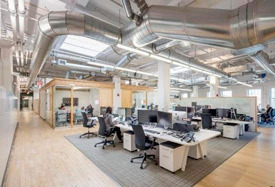 You can read Bisnow’s full article on the evolving office trends, here. The cool office contestants have submitted their new digs. Please have a look and see how yours stacks up. Staples will be offering far more than office supplies; they’re now also providing office space. Yes, the new rollout will allow you to have office space where you buy supplies. The real question: do I want my clients to visit me at Staples? According to a press release, Staples will be opening up communal workspaces at three locations in the Greater Boston area. The migration from “Me Space” to “We Space” will continue as employers accommodate flex time and independent working. At PwC the North American worker had 176 less personal pace in 2012 versus 2010. You can read the full article on Fast Company’s website.